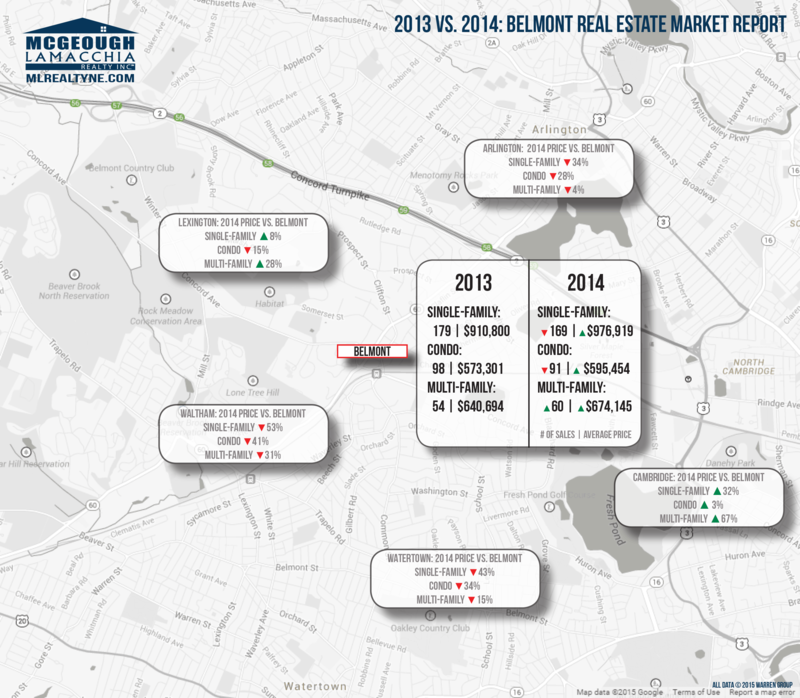 In this “Your Town” report we are taking a deep look into Belmont as a whole and looking at sales numbers for 2014 versus 2013, along with how the towns along its borders did, as well as what’s currently on the market in town right now. 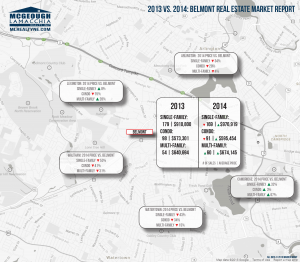 Overall, the housing market remained strong in Belmont in 2014, with a total of 320 homes sold at an average sale price of $748,839. The 320 number includes single-family homes, condominiums, and multi-family homes. That meant a nice increase in the overall average home price, with homes selling for 5.4% more than in 2013. 11 fewer homes sold in 2014 than in 2013, which is part of a trend that contributed to overall home sales in Massachusetts being down 1% in 2014. Single-Family Homes: 169 sold in 2014 versus 179 in 2013, for an average price of $976,919 which is a big increase from the previous year’s average of $910,800. Condominiums: 91 condominiums sold in 2014 compared to 98 in 2013, with an average sold price of $595,454, a good jump from 2013’s average of $573,301. Multi-Family: 60 homes sold in 2014, as opposed to 54 in 2013. The average sale price in 2014 was $674,145, a boost from the previous year’s average price of $640,694. This makes multi-family homes the only category to both see more homes sold, and an average higher sale price. Next, looking at the towns that Belmont shares a border with, we see that the town remains affordable compared to Cambridge and Lexington, where a single-family home can cost up to $314,556 more when you look at average sale prices (see graphic above for a breakdown by town). Arlington, Waltham, and Watertown come underneath Belmont’s average price for a single-family home by anywhere from 34-53%. As of today, March 9, 2015, there are 12 single-family homes on the market in Belmont, with an average listed price of $2,209,991. 4 condominiums join them, with an average asking price of $508,700, and there is currently 1 multi-family home on the market, whose owner is asking for $679,000. That is a total of 17 homes on the market, as compared with 23 on the market one year ago today. Belmont is a residential community of 24,729 people as of the 2010 US Census, located in Middlesex County. Founded in 1864, the town sits in close proximity to the city of Boston, with a short 20-minute drive into the city, or a 15-minute ride on the commuter rail which stops at two locations within the town, making it an excellent option for commuters. Several large open spaces and nature preserves in town offer excellent recreational opportunities, as does a new multi-million-dollar public pool set to open this year and other town recreational facilities. Dining options throughout town range from casual to high-end, offering choices to diners, and many small businesses call Belmont home as well. With so much to choose from, and a highly-ranked public school system, it’s no wonder that Belmont remains a highly desirable place to live and own a home.